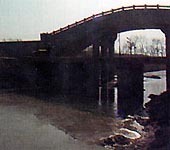 Yuling Bridge spans over the Shiliang River on the western suburbs, 4 kilometers from downtown Xuchang. According to historical records, it was where General Guan Yu bid farewell to Cao Cao and tore his robe during the Three Kingdoms period. On the bridge there is a painting of Guan Yu's story, which was said to be painted by Wu Daozi, a master painter of the Tang Dynasty.